If you’re heading off on one of the most popular trekking routes – the Everest Base Camp trek, Gokyo trek or Annapurna Circuit trek, there is no need to give special thought to hiking food. You can enjoy all your regular meals inside tea houses or trekking lodges. In addition, you can take easy-to-use nutritional supplements, vitamins and minerals along on the trek. If you aim to climb up to one of the trekking peaks such as Lobuche, Island Peak or Mera Peak, you must prepare to switch to Camping trek mode which means sleeping in a tent and remember that you will have to obtain a climbing permit, hire a climbing Sherpa, as well as specially organise food and the items you need for its preparation – gas, lighters, pots, and water, etc. One of most challenging Camping treks awaits trekkers on the route to Mera Peak, because this beautiful peak is located quite a distance away from any settlements where overnight accommodation can be arranged in a lodge with dinner in the usual manner for an Everest Base Camp Trek. However, since scaling trekking peaks is the passion of advanced and experienced trekkers, I will focus on hiking food which you can enjoy in trekking lodges and tea houses during the Everest Base Camp Trek, Gokyo trek and Annapurna Circuit trek. Let’s start with a slight detour so that it is easier for you to understand the menus you’ll read when trekking. Firstly, the Himalayas, which stretch across the entire northern part of Nepal, are mainly inhabited by Buddhists whose faith does not allow them to kill living beings. Meat and eggs for the Everest Base Camp Trek are supplied from Kathmandu or from Pokhara for the Annapurna Circuit Trek. Secondly, the most popular trekking routes such as the Everest Base Camp Trek, Gokyo trek and Annapurna Circuit trek are located far away from any roads and the only way to supply food to these Himalayan regions is by plane. After that, food is carried higher up into the mountains by porters, dzobkeks (a hybrid of yak and cattle) and yaks. This explains the fact why hiking food in the mountains will cost more than in the Nepalese capital Kathmandu or Nepalese paragliding capital Pokhara. In the mountains, basically all hiking food will be brought under great strain on porters’ backs from aviation arrival points. The Everest Base Camp Trek food route to lodges starts from Lukla. In the mountains, these products will be more expensive and might not be fresh as you’d like. This is something that you should give particular thought to in the low season – in December, January, February, as well as during the summer months – during the monsoon period. For these reasons, the choice of hiking food in the mountains is not the widest. 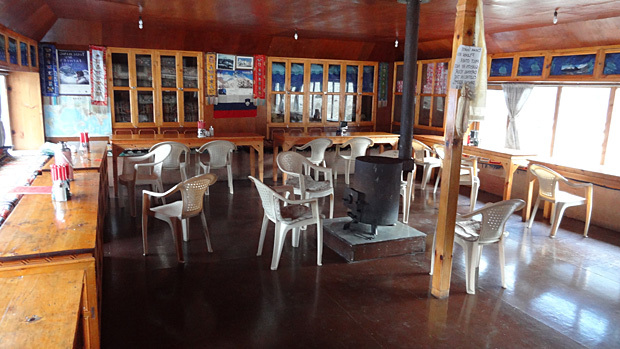 Menus at trekking lodges and tea houses are dominated by flour and cereal products – white bread, pancakes, porridge, French fries, rice, beans, local dumplings Momo with various fillings and macaroni – noodles, pasta, spaghetti of various types, as well as eggs prepared in a number of ways. It is recommended that you order meat dishes at trekking lodges which attract more trekkers, because there’s a greater likelihood that the meat will be fresh. Meat, just like eggs and all the rest is transported from Kathmandu and Pokhara. You should ask your porter or guide to check the freshness of meat. Basically, beef (steak), yak (yak steak) or chicken (chicken curry). Fish meals are unlikely to be available along trekking routes, except in fancier and more expensive lodges. Likewise, don’t expect to find a selection of fresh vegetable and fruit. Moreover, due to climatic conditions, little is grown on mountains above 3,500 metres and on a trekking lodge menu, the word “vegetables” means spinach-like green leaves. I quite enjoyed these vegetables together with traditional Nepalese dal bhaat and had the feeling they nourished my body quite well. Upon arriving in the mountains and starting trekking, during the first three acclimatisation days you should avoid heavy hard-to-process hiking food such as meat and rich fatty foods. This will make it easier for your body to acclimatise.